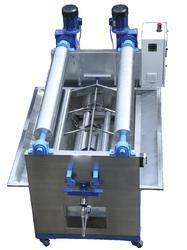 Our product range includes a wide range of automatic jigger dyeing machine classic senior version 1.0. Automatic Jigger Dyeing Machine Classic senior version 1.0 is revolutionizing the textile industry in a big way.The Jigger is the one of the most important for universal textile, bleaching & dyeing machine.Used for pre-treatment of fabrics desizing, scouring, bleaching, dyeing and after treatment of fabrics. Automatic Jigger Dyeing Machine Classic senior version 1.0 runs on zero tension on the fabric, both the guide rollers are individually mounted with gearbox-motor and motors are on inverter drive. This Classic senior version 1.0 has auto drain system. Inverter drive complete with variable running of M/c with auto programmable micro process control.